Print out "Bee a Bee Buddy". This video mentions the bees' wiggle dance, also called a waggle dance. Scroll down to the instructions for the "easy hollow stem bee house" or the "plant pot bee house". Please ask a grown-up to help. Beautifully designed with eye-catching, colourful illustrations... 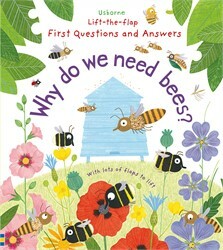 Ideal as a learning tool for parents, nurseries and school, Why Do We Need Bees? offers a hive of fun and important facts for both children and adults. Full of brilliant questions and appealing illustrations that are sure to keep young readers engaged... a great book to share in a learning setting. With clear, colourful, slightly comic illustration, easy-to-read text and durable flaps – inquisitive children will love poring over these titles again and again, acquiring information whilst having fun.